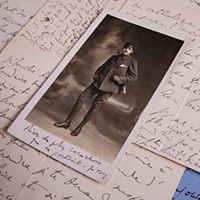 CHAMPAIGN, Ill. — Thousands of letters written by Marcel Proust (1871-1922) will be available to scholars, Proust fans and the public on a website created by University of Illinois researchers and their partners in France to digitize Proust’s correspondence. The Corr-Proust website continues the legacy of Proust scholarship at Illinois. 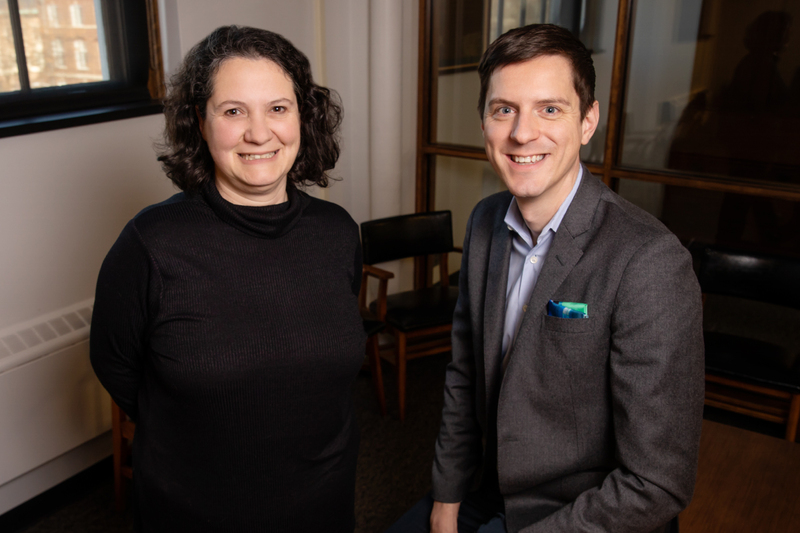 Two researchers who specialize in Proust’s correspondence are overseeing the project – Francois Proulx, a professor of French, and Caroline Szylowicz, the Kolb-Proust librarian and a curator of rare books and manuscripts. A sample of some of the more than 1,200 Proust letters at Illinois’ Rare Book and Manuscript Library. The man in the photograph is the composer Reynaldo Hahn, who wrote a postcard to Proust on the back. The letter on blue paper was written to Proust by aristocrat and poet Robert de Montesquiou. Proust wrote the other letters in the photograph. The Rare Book and Manuscript Library holds more than 1,200 letters – the largest repository of Proust letters in the world. The library acquired many of the letters to support the research of Philip Kolb, a professor of French at Illinois who devoted his career to creating a 21-volume chronological edition of Proust’s letters. Proust rarely dated his letters, so Kolb played detective for 60 years, trying to match the contents of the letters with sources that help verify the dates they were written, such as newspaper stories, stock exchanges and weather reports. Kolb maintained meticulous notes, with 40,000 entries on notecards cross-referenced by date and recipient of the letter. The University Library created the Kolb-Proust Archive for Kolb’s research materials in 1994. The U. of I.’s partners in the Corr-Proust project are the Universite Grenoble Alpes and the Institute for Modern Texts and Manuscripts in Paris. Funding for the project came from the French Embassy in the U.S. and from donors William and Joan Dutton of Chicago. 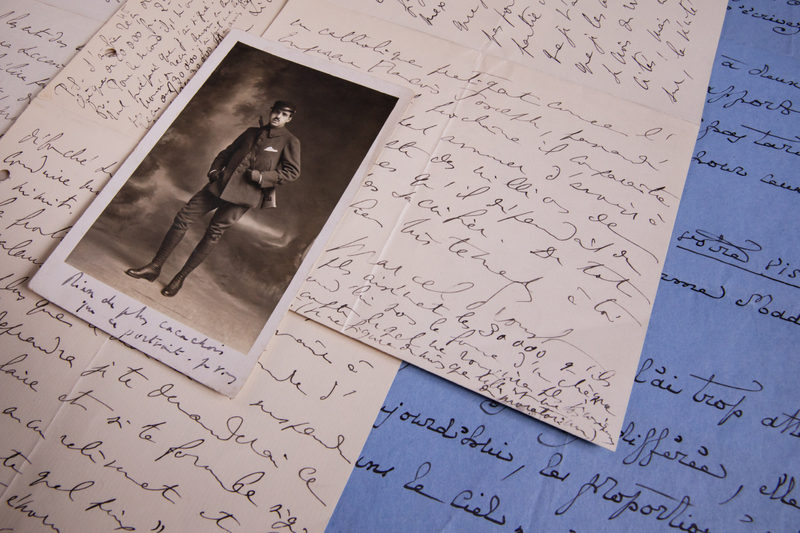 The first phase of the project focused on letters written during World War I because the French embassy’s funding related to the centenary of the entry of the U.S. into the war in 1917. One series of letters on the website relates to possible military service by Proust, who had famously ill health and rarely left his bed. He wrote to a friend, asking him to request medical certificates from a doctor on his behalf that tell why he can’t fight in the war. The website has images of the medical certificates that have never been published. The war years were a particularly creative period for Proust, Szylowicz said. Publication of his novel “In Search of Lost Time” had temporarily ceased and he continued working on the manuscripts, writing new sections dealing with the war. “The novel that comes out doesn’t have much in common with what he had finished (before the war). From that standpoint, it is very significant and becomes a period of very intense creative work,” Szylowicz said. The website will include letters that were only recently published for the first time in specialized journals, as well as letters from many collections, including those held by the Rare Book and Manuscript Library, the National Library in France, other research universities and in private collections. The first phase includes 30 letters, with about 150 more to be added in the coming months. For each entry, viewers can see an image of the letter; a “diplomatic transcription,” which displays text in its original form, including line breaks, abbreviations and misspellings by Proust; a linear text, which shows the text without Proust’s line breaks or other idiosyncratic markings; a translation (still to come); scholarly notes providing context and relevant details; and metadata, which includes such information as the letter’s date, recipient, the type of paper used, where the letter is located and where it has previously been published. The website will allow scholars to see the text as Proust wrote it, in the “diplomatic transcription” section. All printed editions of his letters, including Kolb’s, edited the text for easy reading, eliminating the line breaks, abbreviations, symbols and misspellings of Proust. In one letter that goes on for six pages, Proust finishes the letter, squeezes in a postscript at the bottom of the last page, then continues the postscript at the top of the first page – the only place where there was blank space left to write. Printed editions present the letter in logical order with the postscript at the end. Proust used a particular code to indicate paragraph breaks, and he also used the code like an ellipsis, to indicate a pregnant pause when making a joke, Proulx said. That was also eliminated in printed versions of his letters. One of the next steps for the website is to add a crowdsourcing tool for translation of the letters into English, and later into other languages as well. The vast majority of Proust’s letters have never been translated into English, Proulx said. More than 6,000 known letters by Proust have been published. It will take years to put them all on the website with transcription, text, notes and other information. Proulx and Szylowicz plan to add to the war letters collection and choose other thematic phases, possibly based around the centenaries of Proust winning a major literary prize in 1919, publishing the third volume of the novel in 1920 and his death in 1922. Editor’s notes: To reach Caroline Szylowicz, email szylowic@illinois.edu. To reach Francois Proulx, email fproulx@illinois.edu. The Corr-Proust website can be found at www.corr-proust.org.